The Tudor Oysterdate reference 7032 chronograph is one of the holy grails of Tudor watches and of collectors worldwide. Very few ever come to market and those that exist vary wildly in their overall condition. Dials degenerate badly and spot and flake so finding mint examples is getting harder and harder to do. 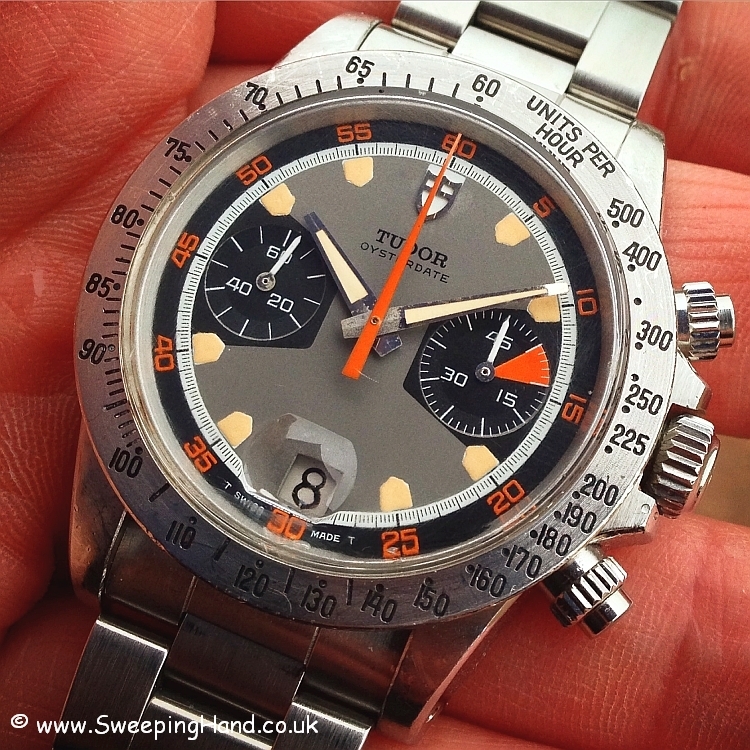 For that reason prices and values of mint examples have continued to rise strongly in Tudor Chronograph terms, similar to that experienced by the ‘Paul Newman’ over the last few years, with serious collectors searching worldwide to have one in their collection. This piece is a a Tudor 7032 reference with the fixed bezel and a real beauty in unpolished condition and with an uncommonly excellent dial. This is one of the very first Tudor 7032 homeplates produced with a 750k serial number. 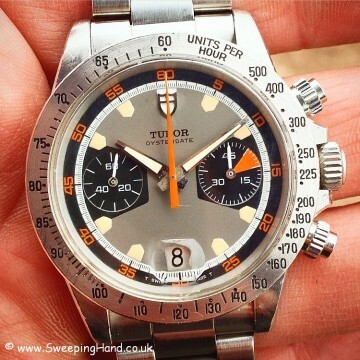 Dial & Hands: Beautiful excellent condition Tudor Monte Carlo grey dial with yellow Tudor ‘home plate’ hour plots and correct matching hands. 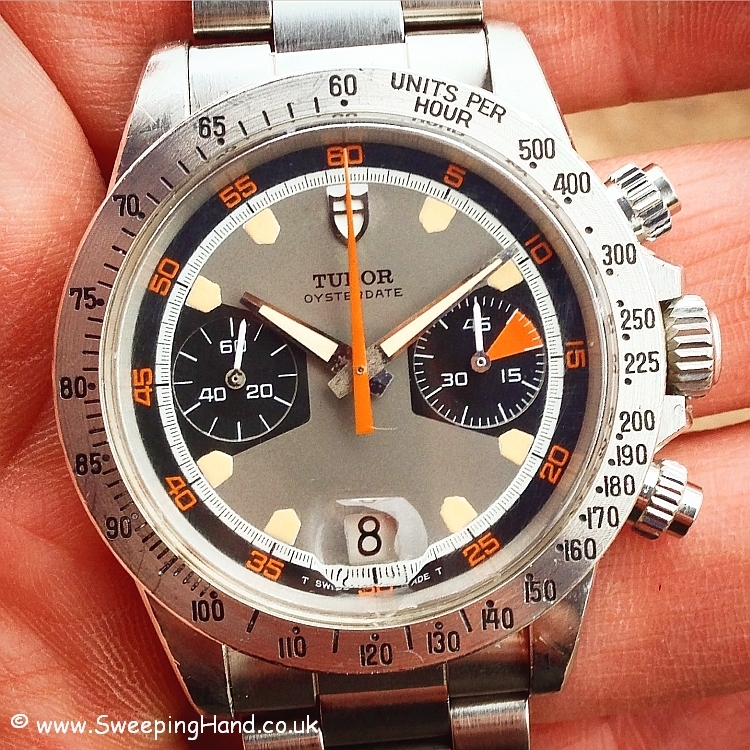 Case & Caseback: 750k serial correct to 1971 with all numbers clearly readable between the lugs. Correctly stamped caseback both inside and outside. Thick lugs with all original bevels showing, extremely clean case and with excellent 500 marker tachymetre fixed bezel. Bracelet: Comes on correct original Rolex 7836 folded link bracelet with correct end pieces and correctly dated clasp. 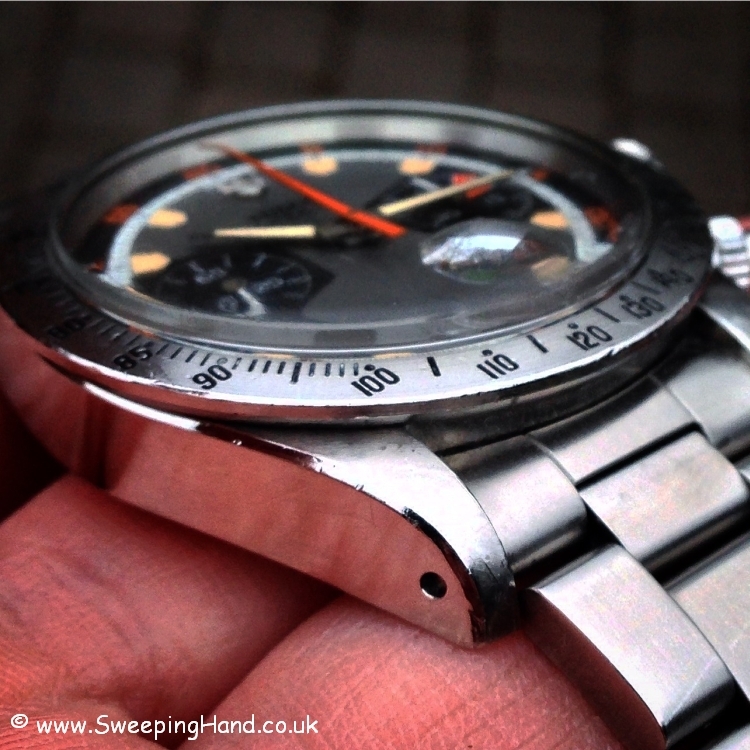 Movement: Original Tudor Valjoux 7734 hand wind date movement in excellent condition and keeping good time. Box & Papers: Comes with an original and rare red stripe Tudor sports box from the early 70’s.